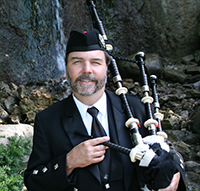 Mark Hamilton, Michigan Bagpiper, has experience piping at a wide variety of venues and events, including weddings, anniversaries, festivals, fairs, banquets, golf outings, etc. If you are looking for a Piper in northern Michigan, he would be pleased to add that Celtic Touch to your event by playing Traditional Scottish and Irish Bagpipe Music. If Mark is unavailable, or if you are elsewhere in the United States, he would be pleased to help you find a Piper through the piping network. Playing Bagpipes for over 30 years. Competed very successfully in solo piping competitions sanctioned by the Western United States Pipe Band Association at Highland Games in Arizona, California, Colorado, New Mexico and Nevada. Western United States Piobaireachd Champion, (Gr. III), 2003. Piobaireachd (pronounced pee-brock) is the centuries old classical form of Highland Piping. Founder of the No Borders Ceol Mor Society, an organization to promote and support piobaireachd workshops in the southwest. In addition to playing piobaireachd, play the more common music of Bagpipe Bands and soloists. Member of the Western United States Pipe Band Association. Member of the Piobaireachd Society, United Kingdom.